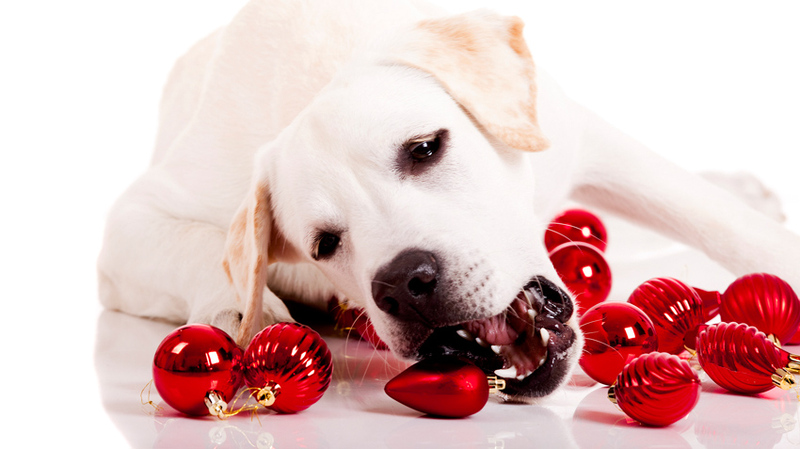 As excited as we are to start decorating for this holiday season, it might seem a little bit overwhelming to keep our furry family members safe and out of trouble. Luckily, we’ve got some simple steps that will let your pets join in the holiday fun while keeping them out of the animal emergency room. Holly, mistletoe and poinsettia plants are poisonous to cats and dogs. Keep them far out of your pet’s reach if you want to decorate your home with them. Edible tree decorations (popcorn, ornaments, etc.) can be very enticing. That kind of excitement is bound to have your pets pawing at them, and your tree won’t be able to stay upright for very long. Burning candles should be kept out of your pet’s way. Elevate them to spaces that your pet won’t be able to reach to keep them from getting burned. Any fireplaces should be blocked with screens to avoid unfortunate accidents. Electrocution is a risk with exposed wiring. Any indoor or outdoor wires (Christmas lights, anyone?) should be taped to the walls or the sides of the house. Don’t let your pet try to help you with gift-wrapping. Paper, string, plastic and cloth can all cause intestinal blockages, which will lead to surgery. Scissors are also dangerous, and should be kept off low floors or tables. Christmas trees alone can host a variety of dangers, but we’re here to help you be prepared! 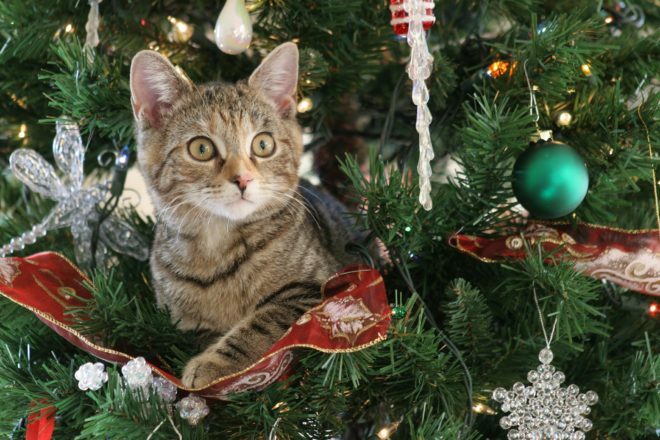 Keep your Christmas trees in the corner, away from common pet areas. If that’s not enough, you can put aluminum foil, plastic drink bottles filled with knick-knacks or anything else that creates noise on the bottom limbs to warn you of impending disaster. Tinsel looks beautiful, but hang it away from your pet’s reach. Ingesting it can cause intestine blockage. Try to keep things off the lower boughs. 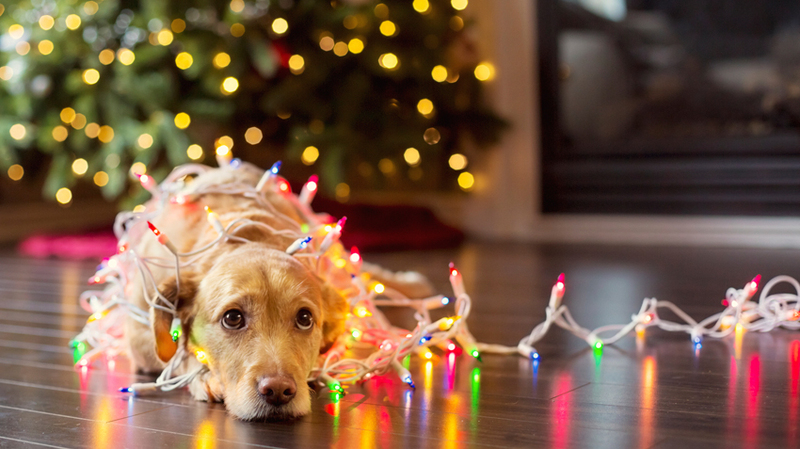 Lights especially provide a burning hazard in addition to the potential for your pet to get tangled. And if they try to bite their way out, they might get shocked. Ornaments should also be kept higher on the tree. If ingested, they are a choking and intestinal blockage hazard, and shards from broken ornaments may cause physical injury. Live trees might shed, but keep pine needles off the floor and away from your pets. If ingested, these sharp barbs can puncture your pet’s intestines.